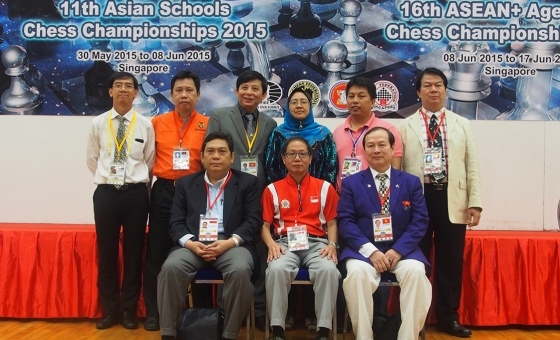 The meeting of the ASEAN Chess Confederation was held in conjunction with the ASEAN+ Age Group Championships and took place on 13th June 2015 at the Sports & Recreation Centre of the Nanyang Technological University in Singapore. Delegates were present from Indonesia, Malaysia, Myanmar, Philippines, Singapore, Thailand and Vietnam, and so of the ten member nations, only Brunei, Laos and Cambodia were able to come. Ignatius Leong (Singapore) was re-elected as President from a new term 2015-2018. GM Utut Adianto (Indonesia) joins the leadership as the new Deputy President while Vijjuprabha Panupand (Thailand) is the new Secretary General. The ASEAN Championships with be held in Thailand in October 2015 together with an Invitational Tournament for ASEAN-Chess and the ASEAN Youth U-20 Masters Cup which is a round robin GM tournament will take place in Indonesia in November 2015 and then again in the Philippines in 2016. The 17th ASEAN+ Age Group Championships was awarded to Chiangmai, Thailand in April 2016.